Embarrassing, humiliating and best forgotten as quickly as possible. Words which immediately bring to mind in the aftermath of Saints 44-10 mauling against the Salford Red Devils at the A.J.Bell Stadium on Thursday night. Fans travelling home to St Helens must have been shaking their heads in sheer disbelief and almost stunned silence at a result which will reverberate around Super League. No one wishes to take the gloss of a superb Salford victory. 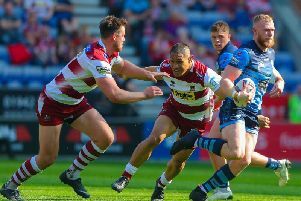 They punished two glaring early Saints' errors and never looked back, putting their rivals from the other end of the East Lancs Road to the sword for the first time since May 15, 2010. Keiron Cunningham's boys didn't get off the team bus, figuratively speaking, and while it would be dangerous to dismiss as “just one of those nights”, the 2014 champions look to have a great deal of hard work to do on the training pitch. Neither did the head coach mince his words after the final hooter had sounded. He said: “It was a horrible start, completely and utterly a mentality thing. We just didn't approach the game with the right mindset. “You could smell an air of complacency about the place just before the game. I spoke to my staff about it, I was a little bit worried about it but, once they're ready to cross the line, it's a little late. “Rugby league is about energy battles and, if you lose the energy battle, you dig yourself into a hole.